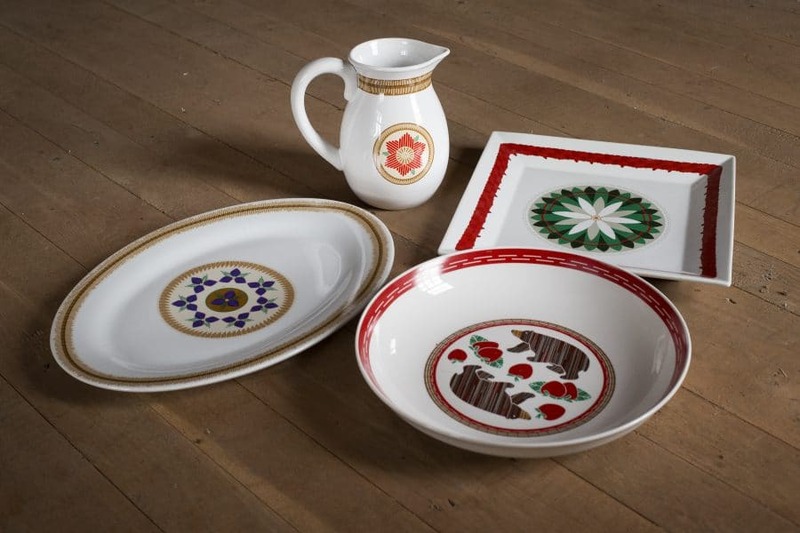 Potawatomi traditions inspire the designs for four limited-edition dinnerware pieces. The Cultural Heritage Center’s vast basketry collection inspired the creation of a limited line of commemorative dinnerware pieces available for purchase through the CHC’s gift shop. Potawatomi began creating highly decorative containers once markets developed and people had more time to spend on basketry, Mosteller said. Like many other aspects of Native American culture, Potawatomi woven art is slowly fading away. The U.S. Forest Service reports climate change and an invasive species of insect, the Emerald Ash Borer, threaten black ash trees’ long-term viability. The Potawatomi have used its bark as an artistic medium for hundreds of years. CPN Graphic Designer Emily Guleresian incorporated traditional Potawatomi imagery into the commemorative dishware. The collection features four pieces that express Potawatomi culture and identity as well as aid preservation efforts. “I tried my best to represent each of the baskets in the dinnerware without compromising the finished printed product,” Guleresian said. The serving bowl from this collection features a bear and strawberries. The original basket was made for a spiritual leader on Walpole Island, Ontario, Canada. His wife, who wanted the design to represent her husband, and specifically the Bear Clan, includes the foods that bears eat. In the case of the basket, strawberries, blueberries and Coho salmon are all depicted. The wife stopped by the CHC while visiting relatives in the area. After seeing the museum, she offered the piece to CPN, he said. “It’s really the key basket that we have in our relatively large basket collection,” he said. “It’s one of our landmark pieces. The serving bowl also depicts strawberries, a fruit revered by the Potawatomi. She stressed one must eat the entire strawberry, including the greens, to take full advantage of its health benefits. “Those berries are things that grew wild in the forests of the Great Lakes. They were gifts. We can still honor and remember today to respect the berries, especially the strawberry, and the fact that it’s something passed down from generation to generation through our communities,” Mosteller said. The pitcher features a red floral design inspired by another basket within the CHC’s collection. The original piece utilized wigwas (birchbark), wishkbemishkos (sweetgrass) and gawey (porcupine quills) in its construction. Another single-floral design served as the inspiration for the oval platter. The black ash strawberry piece featured in the CHC’s third exhibit inspired the design for the square serving platter. “This was the most difficult pattern to create because the basket is very three-dimensional,” Guleserian said. Guleserian’s favorite is the pitcher or the bear bowl. The commemorative basket dinnerware pieces are available to purchase individually or as a set for a limited time only. Check out the Citizen Potawatomi Gift Shop in person or online today, giftshop.potawatomi.org.